Taken as an invitation to geopoetry, the effort to rename the current geological epoch from Holocene to Anthopocene is also an invitation to speculate, to forgo in Donna Haraway’s phrase, “the solace in human exceptionalism”. In the space opened by such a turn, perhaps a glimmer of something else can form, perhaps as she suggests, an ethical reworlding. When the geologist Harry Hess first published his theory of plate techonics in 1962, he called his article ,History of Ocean Basins, “an essay in geopoetry” to promote something similar. The theory then was revolutionary but the data did not yet exist to prove it. Here, an appeal to the poetic paid off. Andrew C.Revikin, writing in the NY Times, discusses the recent progress in the effort to officially replace the name of the current geologic epoch. While the International Commission of Stratigraphy moves at an appropriately geologic pace, its Anthropocene Working Group has concluded that not only is the renaming appropriate, they have identified when it began – July 16, 1945. 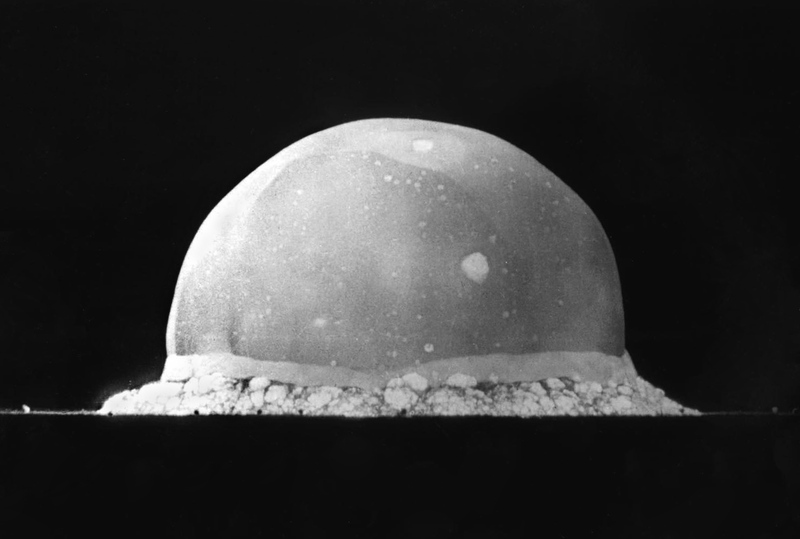 The proposal… is that the beginning of the Anthropocene could be considered to be drawn at the moment of detonation of the world’s first nuclear test: on July 16th 1945. The beginning of the nuclear age, it marks the historic turning point when humans first accessed an enormous new energy source – and is also a time level that can be effectively tracked within geological strata, using a variety of geological clues. The intersection of the Nuclear Age and the Anthropocene is bound up with another technological development – the computer. Undoubtedly without WWII and the Cold War inventive humans would have developed both nuclear weapons and the computer without a common purpose. Their actual paths of creation however, intersect and intertwine. The atomic bomb, the fission bomb, requires certainly a high degree of precision to design and fabricate. The mathematics needed for the project however, did not require computers. Donna Haraway found this common heritage important in the development of her conception of the cyborg. The cyborg is a condensed image of both imagination and material reality, the two joined centres structuring any possibility of historical transformation…. The cyborg incarnation is outside salvation history…. In a sense, the cyborg has no origin story in the Western sense — a ‘final’ irony since the cyborg is also the awful apocalyptic telos of the ‘West’s’ escalating dominations of abstract individuation, an ultimate self untied at last from all dependency, a man in space…. This Haraway-ian sense of “cyborg” is what I refer to here at Atomic Geography, rather than the literal sense of sci-fi and bio-hackers. Not only do cell phones and self surveillance devices make us cyborgs, the resulting information driven environment, the dependence on massive extractive and fabrication industries do as well. The way in which we produce our food, clothing and shelter all make us cyborgs. I have argued here that “Anthropocene” is inadequate as a description of this state of affairs, that it does not capture the symbiosis of human and machine represented by the cyborg. Instead I have used “Cyborgocene” to cover much of the same ground, but perhaps with a stronger geopoetic flourish. Still, the continued progress of “Anthropocene” as an official designation is in itself is a significant development. Not only does it claim that humans are largely responsible for the climate change currently underway, but that human activity is the defining feature of the earth’s surface.